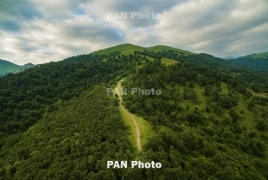 PanARMENIAN.Net - Cartisan, a new independent branch of the Transcaucasian Trail,will design and publish a brand new hiking map of Armenia's beautiful Dilijan National Park – the first map of its kind in the region – and distribute it worldwide for the start of the 2019 hiking season. They are aiming to raise $12,900 in Indiegogo to create the map and are currently halfway to their goal. It's part of a bigger shared mission to bring quality outdoor mapping and trail infrastructure to the Caucasus. While any amount can be donated, a pledge of USD$30 will get you a copy of the map to put on your wall, pore over while planning your hike, or navigate with, plus a bonus goody pack. Dilijan National Park now features more than 200km of waymarked and signposted hiking trails, including an 80km section of the Transcaucasian Trail. Hikers wanting to navigate them are already asking for detailed maps from tourist information centres – but no such maps exist. And until recently, nobody had the knowledge, expertise or motivation to create one.